Rick Mullin’s most recent collection of poems perfectly captures the eccentric, hectic, bluesy lifestyle epic of The Rolling Stones. Each canzone—a poetic form in which five end words occur in different order over the course of five twelve-line stanzas and an envoi—explores one or more key episodes in the history of the band. From their 1960s trip to Morocco while awaiting a conviction on drug charges, to the 1971 sessions for Exile on Main St., recorded in the basement of Keith Richards’ French villa, each canzone balances darkness with light, often through humor born of time’s distance and sympathetic attention to the musicians’ human foibles. Especially impressive is that a poetic form of such strict parameters yields poems that are, by turns, funny, flexible, and, touching. The Stones’ music remains essential, and Mullin’s sequence covers some of their most iconic tunes. In “Keith holds up a wall and peels a classic riff. No. 3: The Rolling Stones in Sympathy for the Devil,” Mullin writes of the late Brian Jones’ decline into addiction as glimpsed in Jean-Luc Godard’s documentary of the Stones at work: “Jesus, will you look at Brian Jones” and, later, “Now strumming chords behind a padded wall,/a multi-instrumental waste of talent.” Evoking the famous refrain of Bob Dylan’s “Ballad of a Thin Man,” Mullin observes coolly, “The dying Jones//a perfect foil to Dylan’s Monsieur Jones.” The political content of Godard’s film, juxtaposed with tense scenes in the recording studio, includes members of the Black Panthers reading from radical texts: “And now, an Afro-Marxist Bill/of Rights is read. “ Later, the director appears in his own film: “Godard is painting something on the wall:/Mr. President, tear down this wall!—a line ironically post-avant garde and premature. It’s retrograde. 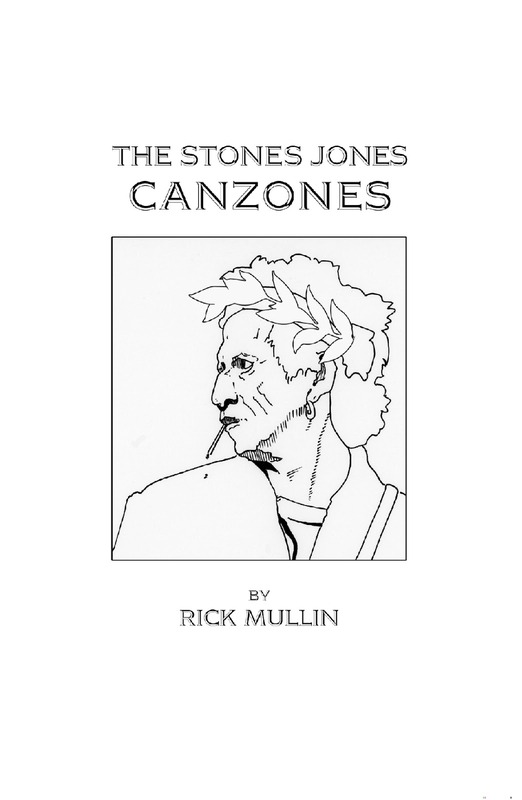 Now all the pieces fall together.” Clearly, Mullin juggles many disparate “pieces,” yet this canzone “falls together” to provide an unforgettable picture: of band tensions and dissent, history at a crossroads, vivid contrasts of politics and perspective. Even more astonishing is that, in Mullin’s hands, the highly restrictive canzone can range so widely and fluently over varied material despite the formal limitations of stanza shape and end-word selection. Mullin’s skill at incorporating swift flashes of dialogue and history within the canzone’s confines is evident in his version of the Altamont negotiations: “The lawyer, pacing, lights another Vice-/roy. ‘Golden Gate is out. The council’s fighting/us on every front. I’m good with fighting, but we need a parking lot. Advice?’/ Keith, essentially still on the airplane:/’Make it big enough to park the airplane!’ Here, as elsewhere, abrupt transitions between humor and tragedy, the comedic and the dismal, define the lifestyle of the Stones at the close of the ’60s; and, as elsewhere in The Stones Jones Canzones, the poet captures these contrasts perfectly. Mullin’s understanding of rock music, social history, celebrity culture, and human frailty vividly combine in a unique chapbook that is a must-read for anyone with even a nodding familiarity with the Sixties or the Stones—and equally essential for anyone with an interest in how traditional poetic forms, rather than restricting an author, may help to generate verse of striking fluency and power. Kenneth McNickle is a recent Loyola University Maryland graduate. He is an aspiring writer and musician. He plays the trumpet, guitar, and piano.